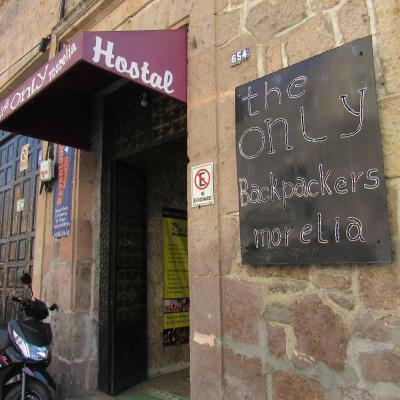 Lock in a great price for The Only Backpackers Morelia – rated 8.1 by recent guests! Nice, very Clean. The Owners are amazing. Very welcoming!!! Helping me with excellent advice. Even booking a tour for me. Making a great experience overall!!! The staff was very friendly and helpful. I decided at around midnight that I wanted to attend the Monarch butterfly bio reserve the next day in the morning and the Hostel staff contacted them at that time and arranged a time for the tour people to pick me up. Food was not provided besides water, coffee, and tea. That is how they are able to keep the hostel affordable. The beds were hostel beds so I can't expect high quality mattresses. They had hot water which was a plus since i've been in hostels that don't have hot water. The place is small but comfortable. It's location is close to everyone, yet not too close for you to hear all of the noise from the city. Overall I would stay here again. The owner was more service minded. That I could come in 4am one night, even I had told them before, that I will not be back before daylight. The host was wonderful! He was very welcoming and made me feel as ease. This was my first hostel experience and very pleased. The decor was very cute and I loved the coffee and tea available. the owner of the hostel is so friendly and kind.. as also all the staff.. The owners of the hostel are really kind and hospitable. They help you with everything you need. During my stay there, they invited me to eat with them a couple of times. I really liked it and it was great value for money. Plus I met really cool people at the place. Personal was very nice and attentive, the location was pretty good. 1) Mr. Feliciano is an astonishing person 2) The location is in the parallel street to the main one, and it was surprisingly quiet on the weekend. 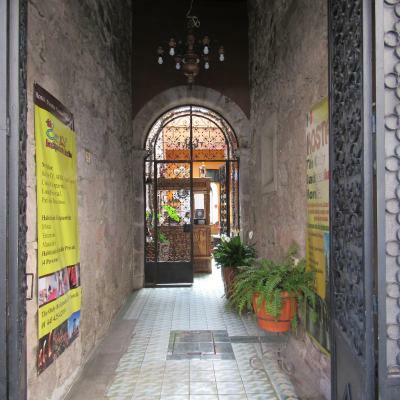 Located in downtown Morelia, this hostel features a colonial Mexican-style and is located just 2,800 feet from the city’s main square and 150 feet from the city’s main street. Each room here features Mexican traditional décor. There is a shared terrace and TV area. The property has a shared on-site kitchen. Guests will find a variety of restaurants and bars within a 5-minute walk. The hostel can also help arrange outings to local sights with at additional cost. The General Francisco Mujica International Airport can be reached in a 30 minutes’ drive. 뀐 Located in the real heart of Morelia, this property has an excellent location score of 9.1! When would you like to stay at The Only Backpackers Morelia? This room features a seating area, a wardrobe and a shared bathroom with a shower and toilet. This dormitory room features a seating area and lockers. There is a shared bathroom with a shower and toilet. House Rules The Only Backpackers Morelia takes special requests – add in the next step! The Only Backpackers Morelia accepts these cards and reserves the right to temporarily hold an amount prior to arrival. Please inform The Only Backpackers Morelia of your expected arrival time in advance. You can use the Special Requests box when booking, or contact the property directly using the contact details in your confirmation. Cleanliness is not so good, bathrooms were very dirty with bad plumbing. The shower. Was very far from the bedroom and accessed from the outside, plus the water was not very hot. The family at the hostel were lovely, especially Feliciano. beds are very poor quality. Hard to sleep on. many children, part of the family, running around and screaming the floor is not very clean the tv in the lobby seems to be for family and friends watching football.... clients were asked to leave if they didn´ t watch the game. the owner is a great and very helpful friendly man. Everything. Not clean enough, not user friendly, no helpful extras AT ALL, really ugly, cluttered group room, small messy kitchen,no place to sit comfortably or put anything down except in my room which had TERRIBLE lighting unless you want blue "mood" lighting ALL the TIME. The owner was a nice fellow and I slept well because it was quiet. Unfortunately this has been the worst hostel I have stayed in during all of my Mexico travels. First of all - I got bed bugs here...so just a warning. Please owners wash all the blankets regularly and provide an extra sheet to put under the blanket(! ), it's not enough to just give the guests a pillowcase and a down sheet. Very weird hostel setting. It's the owners house and they and their kids live there. I personally felt quite uncomfortable as if I was intruding in their space as the kids and the parents, and their friends and other family members were always in the common areas so the few guests that were staying there didn't really have much space to hang out in. Not only that but the female dorm I booked had 5 bunk beds in it (fairly sure it's also advertised differently on booking.com), and the room was tiny, I barely had any space where to put my things and that was with only 4 of us staying in the room, I dread to think what it would be like when the room was full. And the kitchen, wow. Obviously they live there and are a big family so there will always be a mess in the kitchen, with some rotting veg lying about. Another thing is that they don't give you a key to the front door so you always have to ring a bell and hope to cheesus someone will hear it. One morning, I came back from a run at around 9am and waited for about 10 minutes until someone came and opened the door. The family who runs the place are nice, nothing to write home about but they're pleasant if that's your thing. The courtyard area is quite nice too. The WiFi was OK. Truth is you'll probably end up staying here anyways as there are no other hostels in Morelia. If you can splurge out and get a Hotel really. Would not recommend this hostel. When I checked in, the woman did not find my reservation - only the one for the days I had cancelled. She was not friendly either. She did not speak English. I did not feel welcome. The owner speaks some English, not much, even there is stated, English spoken. There were too many beds in the room, nearly no space in between. Only one person at the time could leave the bunk beds - the space was to use of four people! I didn't get the room I booked (booked one with 7 beds, got one with 10 beds) There were only two showers for all the people - all the several rooms. The showers were not really clean and in the smaller one of them, the water spreads in the whole tiny room, when showering. There were no possibilities to have you clothes in the shower room (no bench or similar). The kitchen was too small for so many people. It was not really clean, there were always unwashed dishes and the dryrack was always full. I had Everytime, when I want to use the stove to ask the owner to get the gas on fire. Friendly and helpful. A nice hostel. The private room was in the far back which on Thursday night was a bit noisy. It’s to be expected in such a vibrant city.